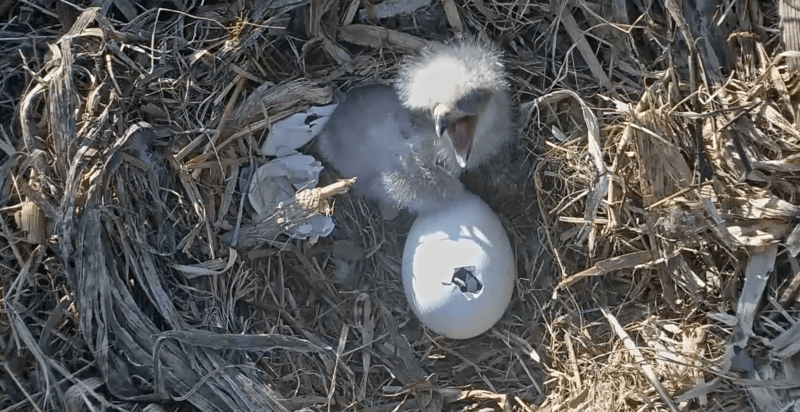 Two bald eaglets have hatched at the University of Notre Dame’s Linked Experimental Ecosystem Facility (ND-LEEF) in St. Patrick’s County Park. The pair of bald eagles, who first claimed a former red-tailed hawk nest in 2015, laid the eggs at the end of February and the eaglets hatched on Monday (April 2). Starting this season, viewers have had a bird's-eye view of the nest thanks to the in-nest eagle cam that was installed in fall 2017. Mounted in the tree above the nest, the new cam allowed viewers to watch the beginning of the nesting cycle, which included the bald eagle parents adding sticks and grass throughout January and February, followed by a 35-day incubation period. Now that the eaglets are born, those watching the live feed may catch various eaglet milestones. For example, in the first two weeks one parent will primarily remain in the nest while the other will hunt and bring food into the nest. During this time, the parents will directly feed the eaglets by mouth. After three weeks, the eaglets will begin pecking at the food that the adult eagles drop into the nest. Over the next few weeks, eaglets may be seen “practicing” how to fly in the nest by beating their wings to build flight muscle. Around the age of 10 to 12 weeks old, the eaglets will grow wing feathers and should soon take their first flight as they begin developing skills for flying and hunting. Viewers can expect to see the eaglets until their likely departure near the end of the summer. Before they leave, though, avid ND-LEEF eagle cam fans will have an opportunity to suggest names for the eagle pair via social media. This is the fourth year this pair of eagles have returned to their nest at ND-LEEF, as eagles are known to practice nest site fidelity – returning to the same nest and nesting territory year after year. This means that eagle cam viewers can look forward to continuing to watch the same eagle parents raise eaglets for several years to come. The eagles at ND-LEEF, as well as a pair from Potato Creek State Park, were the first successful bald eagle nests ever recorded in St. Joseph County. Bald eagles were reintroduced in Indiana during the 1980s after the eagle population began to severely decline throughout the U.S. from the 1950s onwards. Bald eagles were placed on the endangered species list in 1967 but were eventually removed from the list in 2007. ND-LEEF is a globally unique research facility that houses two engineered experimental watersheds, each consisting of an interconnected pond, stream and wetland. Scientists use ND-LEEF to conduct experiments in a field-like setting but in a more controlled environment than one can find in nature. Both experimental watersheds are roughly the length and width of a football field and located five miles north of campus on six acres of land within St. Patrick’s County Park. To watch the live, in-nest eagle cam or to learn more about ND-LEEF, visit environmentalchange.nd.edu/resources/nd-leef/. 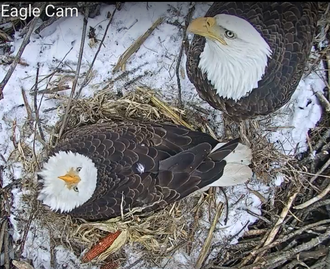 Fans of the eagle cam are encouraged to share any exciting nest activity by using #NDEagleWatch and by tagging @NDLEEF. Originally published by Brandi Klingerman at environmentalchange.nd.edu on April 2.